What’s most striking at first glance about neo-expressionist painter Manuel Mathieu’s exhibition of paintings, “PRÉMICES/OPEN ENDED”, is not the work itself, but the curatorial decision to paint one of the gallery walls a brilliant yellow. Perhaps it’s unfair to suppose that everyone will be impressed by this. I noticed it because it is the same yellow as my bedroom wall, with which I have a fairly unhappy relationship. “Yellow is a colour, for all its dramatic unalterability, with a thousand meanings”, writes Alexander Theroux in The Primary Colours. “It is the colour of cowardice, third prize, the caution flag on the auto speedways…Easter is yellow. So is spring.” In my case, it is a colour that yells at the fitful sleeper. As a framing mechanism the precise illumination of one gallery wall grabs attention. Its disruption of the white cube is a reminder of the influential power of colour—a muscle Mathieu wields to success in his canvasses—and of the relationship that can be forged between artwork and gallery space. In this show narratives are not told by recognizable images. The canvases on display present “quasi-figuarative specters,” fragmented heads that recall those of Jean-Michel Basquiat— “le James Dean de l’art contemporain” (Emmanuel Gallad, curator). Basquiat most definitely influences Mathieu’s work, but it would be unfair to linger long on the connection. “C’est normal par contre pour un jeune artiste d’être fasciné par le parcours fulgurant, le mythe ,” says show curator Emmanuel Galland. Mathieu is Haitian born, having immigrated to Canada to earn a BA in Visual & Media Arts from UQAM. Gallad describes him as an ambitious person, involved in his student community and thirsty to learn. It is explained on Mathieu’s website that his art making began at “an early age [when] mirroring “Bad Art” painting, Manuel began transforming his childhood bedroom into a “Sistine Chapel” of graffiti” (to see images of Mathieu’s childhood bedroom in Haiti click: ROOM). He claims his colour application is spontaneous and motivated by “the proximity of the tubes of paint.” If this is true then he has a habit of leaving the tubes of blue and aqua-green nearby. It would appear to me that Mathieu is not disinterested in colour choice, but is captured by the states of mind that colours engender. Aqua green is the hue of longing, especially for those dreaming of warm waters. Blue is a void, an infinite space or an open-question. Mathieu’s canvasses ask questions (some OPEN-ENDED, as per the English title of the show). What do these fragmented figures have to say? Are they screaming, or smiling? And as the French title of the show, PRÉMICES, suggests, this work marks one beginning, hopefully among many, in the trajectory of an artistic career propelled by existentialist inquiry. PRÉMICES/OPEN-ENDED at MAI (Montreal, arts interculturels) until May 5th. www.m-a-i.qc.ca. 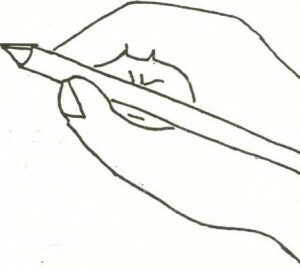 www.manuelmathieu.com. 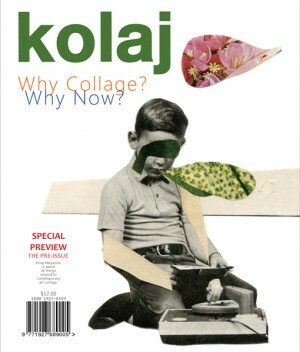 A magazine for collage-lovers, scissor-obsessors, and appreciators of quality printed matter. I contributed to the Special Pre-Issue of this mag, and can’t wait for the launch of Issue 1. Check it out! On a discreet street just north of Jean-Talon, in that shapeless neighborhood between the borders of Little India and Little Italy, gallery Battat Contemporary hosts Further Negotiations by Kamrooz Aram. 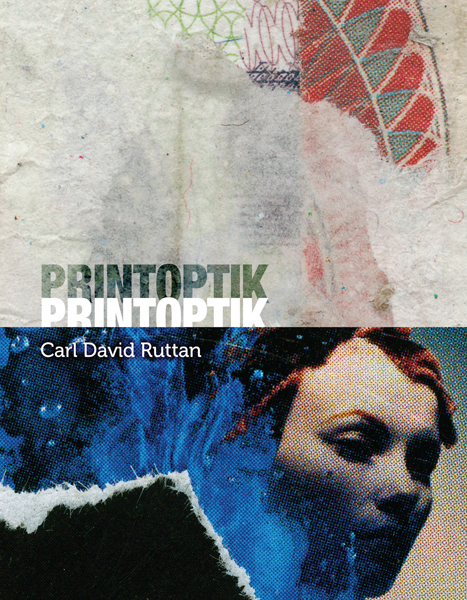 Maison Kasini announces the publication of Printoptik, which acts as a lens presenting several points of view on the work of artist Carl David Ruttan. Essays by Mark Grenon, Meaghan Thurston, and Henri Michaud explore the different ways in which the artist uses collage in his work. 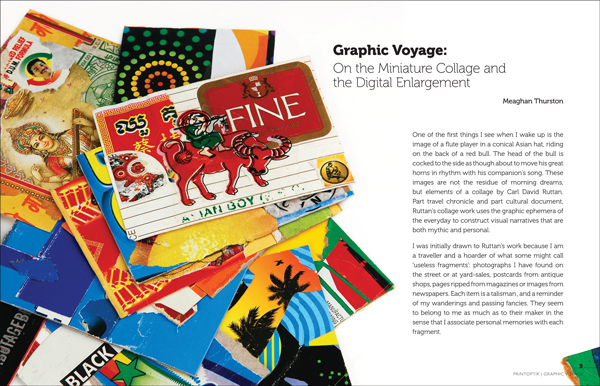 Ruttan produces a large body of small art collages while travelling. His source material is bits of found paper collected while walking the streets of lands both foreign and familiar. At home, he blows-up the collage to make a one-of-a-kind fine art print that explores the micro-world of paper. Ruttan has also taken thousands of photographs of “found collage”: images of layered and torn posters, paints and textures. The processes of street photography, decollage and collage merge to take the reader on a visual journey. And check out this necklace. So beautiful! 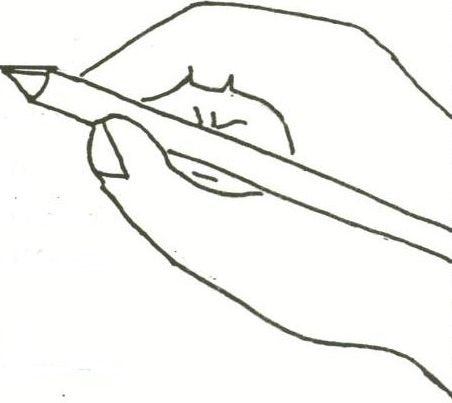 "Who will teach me to write? A reader wanted to know. The page, the page, that eternal blankness, [. . .] that page will teach you to write." I got to interview CBC’s Jonathon Goldstein for this piece, which was like talkin’ to the radio…. Maisonneuve Magazine teams up with Literary Death Match to revitalize the literary reading, with guns and cupcakes. EVENT DETAILS: Tuesday, October 11, 2011 at La Sala Rossa 4848 Boulevard Saint-Laurent. Doors at 7; Show at 8:15 (sharp). $7 pre-order; $10 at the door, including a FREE copy of Maisonneuve’s Fall Issue. Literary Death Match is poised to deliver a beat down to Montreal’s writing scene tomorrow night at La Sala Rossa. If you’re not tapped into the death match movement you are not alone, but the event’s popularity is growing worldwide. When author, radio host and to-be LDM judge Jonathon Goldstein and I chatted about the upcoming event he quickly confessed that he knew nothing at all about it, but that they “seemed nice” so he’d agreed to take part. Follow me as I masquerade as a fashion-know-it-all at on the Annex Vintage blog! 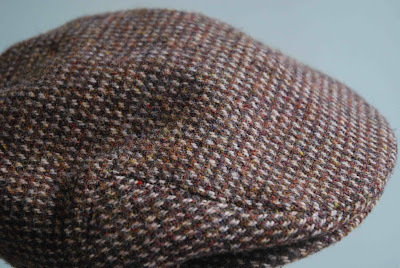 I’ve been offering up my take on clothing and style for some months now, most recently to constructing an autumn wardrobe of entirely the vintage items. 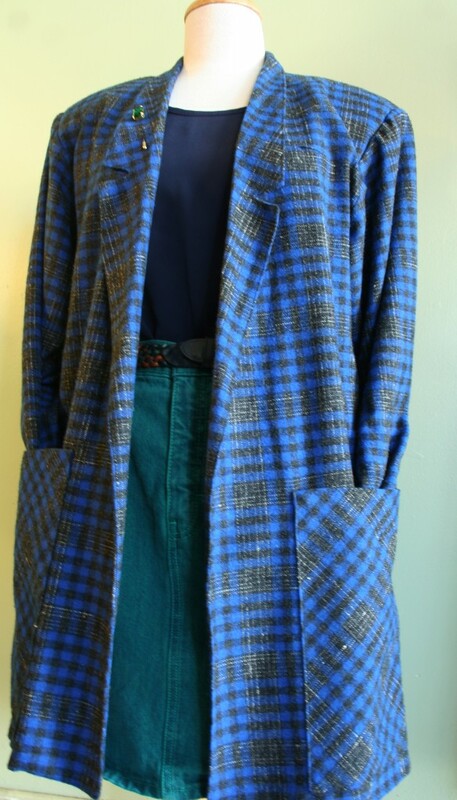 All the articles I’ve chosen can be found at Annex Vintage (but, they’re one of a kind!). There was a surplus of fun stuff to do on Tuesday evening. Theatre Ste. 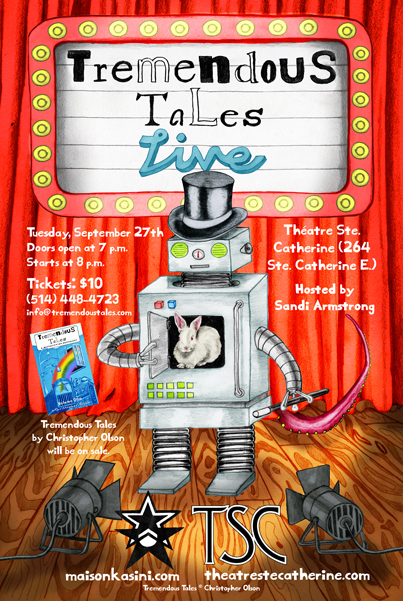 Catherine’s Improv Company brought the first issue of microfiction anthology Tremendous Tales to life through projection and performance. Not for Sci-Fi lovers only, in Tremendous Tales, author Christopher Olson takes the reader on brief excursions into the speculative, the fantastic, and the absurd. Théâtre Ste. Catherine’s Sandi Armstrong hosted the event. Stay tuned to www.maisonkasini.com for the next one! Not to be missed. And if I’d had time I would have dropped by local designer studio Atelier B. for the official opening of their charming and historic space (5758 Boulevard Saint Laurent). Friend and photographer Francesca Talone projected her short film ‘ate4′, along with ‘The Work That We Do’, by Tom Fennario and ‘Fade Out, by Tommy Caron.